Kante has overtaken Eden Hazard and is being paid an incredible £290,000 a week. The midfielder was linked with a move to PSG and even Manchester United this week, but the new deal will end speculation over his future. Kante has become a key part of the Chelsea team and won the Premier League in his first season with the club. He had signed as a Premier League champion already after helping Leicester stun the footballing world. “I’m happy to extend my time with Chelsea,” he said. “It has been two beautiful years and I wish for more to come. “Since I came, I completely improved as a player, challenged myself and got some awards I never thought about. 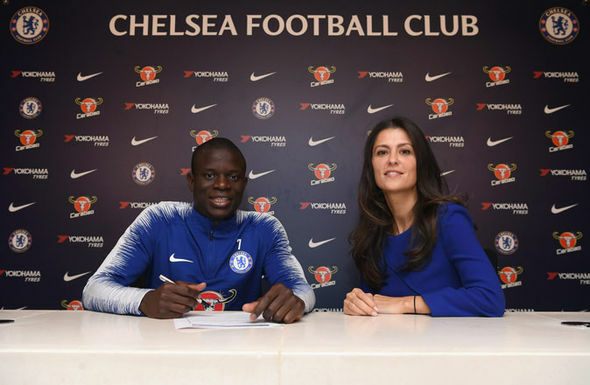 “I like the city, I like the club and I am happy to be here for more time.” Club director Marina Granovskaia added: “We are delighted N’Golo has signed a new contract and sees his long-term future with Chelsea. “When he arrived, we knew we had signed a special player but he has astounded everybody with his tireless and unselfish displays. “Off the pitch, he remains a dedicated professional and a humble human being despite the fact he is a world champion and a two-time Premier League winner. “We now look forward to five more years with N’Golo at the heart of the Chelsea midfield.” Kante made a total of 48 appearances in all competitions for Chelsea last season, scoring one goal, and has featured in 20 games in the current campaign. Hazard is also in talks over a new deal and is likely to be handed a package worth £300,000 if he signs it.